The arrest of Saif-el-Islam Gaddafi, a man wanted for crimes against humanity, including murder and persecution, by the International Criminal Court (the ICC) and implicated in other human rights violations in Libya in the period since 15 February 2011, marks a key moment in the Libyan struggle against human rights violations and provides an opportunity to establish a new state based on the foundations of justice and the rule of law. 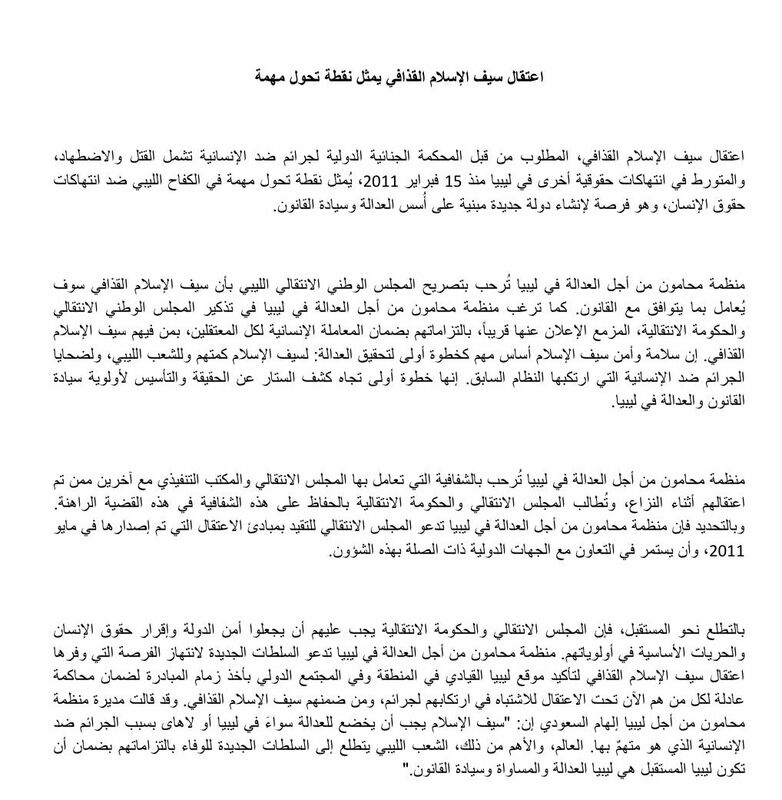 Lawyers for Justice in Libya (LFJL) welcomes the statement by the National Transitional Council in Libya (the NTC) that Saif-el-Islam Gaddafi will be treated in accordance with the law. LFJL reminds the NTC and the soon to be announced interim government of their obligations to ensure the humane treatment of all detainees, including Saif-el-Islam Gaddafi. The safety and protection of Saif-el-Islam is paramount as a first step to ensure justice: for Saif-el-Islam as a suspect, for the Libyan people and for the victims of the crimes against humanity committed by the previous regime. It is a first step to unveiling the truth and establishing the primacy of the rule of law and justice in Libya. LFJL welcomes the transparency with which the NTC and its Executive Committee have dealt with others detained in the course of the conflict and calls on the NTC and the interim government to maintain this transparency in this instance. In particular, LFJL calls on the NTC to adhere to the guidelines on detention it issued in May 2011 and to continue to cooperate with the relevant international bodies. In looking forward, the NTC and the interim government must prioritise the security of the state and the promotion of human rights and fundamental freedoms. LFJL calls on the new authorities to take the opportunity presented by the arrest of Saif-el-Islam Gaddafi to affirm the position of Libya as a leader in the region and the international community by taking the lead in ensuring a fair trial for all those currently held on suspicion of committing crimes, including Saif-el-Islam Gaddafi. “Saif el-Islam must face justice for the crimes against humanity of which he is accused; he must have a fair trial, whether in The Hague or in Libya. The world, and more importantly, the Libyan people are looking to the new authorities to fulfil their responsibility to ensure that the Libya of the future is a Libya of justice, rule of law and fairness,” said LFJL Director Elham Saudi.